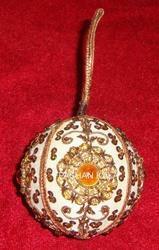 Zari Embroidery Christmas Ornaments offered are perfect choice to light up the mood and prepare the home interiors for Christmas festival. These exclusive hanging fish decorative can be hanged from ceiling or a light fixture and are best choice to decorate a ballroom or to fill your room up. The attractive look provided by these fish shaped decorative also makes these the best party decorations that greet the guests and set up the stage for party. 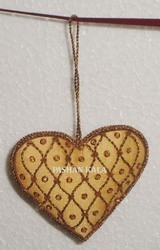 •Material : Zari Embroidery and Beads, sequence with different kind of fabric etc. •Manufacturing Process : Hand embroidery work through needle on fabric. Zari Christmas Hanging Balls offered is among the best choices offered that are used for enhancing the look and feel of the home interiors. With these exclusive finished embroidered hangings available in different finish options, these perfectly match up to the demands of the customers and other than homes can also be used in decorating church or workplace. Further, the rich finish and variety offered also make these decorative the best choice for throwing office Christmas party and make the occasion a huge success. 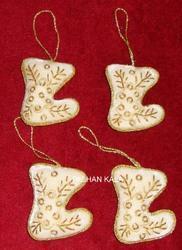 Christmas Decorative Hangings Ornaments offered is among the best choices offered that are used for enhancing the look and feel of the home interiors. With these exclusive finished embroidered hangings available in different finish options, these perfectly match up to the demands of the customers and other than homes can also be used in decorating church or workplace. Further, the rich finish and variety offered also make these decorative the best choice for throwing office Christmas party and make the occasion a huge success. Christmas Decorative Ornaments offered is among the best choices offered that are used for enhancing the look and feel of the home interiors. With these exclusive finished embroidered hangings available in different finish options, these perfectly match up to the demands of the customers and other than homes can also be used in decorating church or workplace. Further, the rich finish and variety offered also make these decorative the best choice for throwing office Christmas party and make the occasion a huge success. 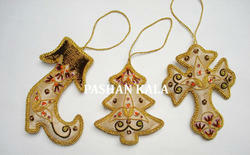 X-Mas Hangings Items offered are perfect choice to light up the mood and prepare the home interiors for Christmas festival. These exclusive hanging fish decorative can be hanged from ceiling or a light fixture and are best choice to decorate a ballroom or to fill your room up. 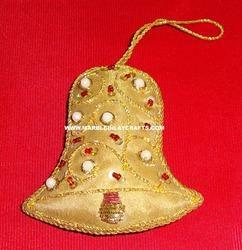 The attractive look provided by these fish shaped decorative also makes these the best party decorations that greet the guests and set up the stage for party..
Zari Embroidery Christmas Hangings Bell offered is among the best choices offered that are used for enhancing the look and feel of the home interiors. With these exclusive finished embroidered hangings available in different finish options, these perfectly match up to the demands of the customers and other than homes can also be used in decorating church or workplace. Further, the rich finish and variety offered also make these decorative the best choice for throwing office Christmas party and make the occasion a huge success. 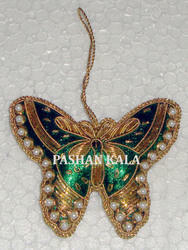 Zari Embroidery Christmas Hanging Butterfly offered is among the best choices offered that are used for enhancing the look and feel of the home interiors. With these exclusive finished embroidered hangings available in different finish options, these perfectly match up to the demands of the customers and other than homes can also be used in decorating church or workplace. Further, the rich finish and variety offered also make these decorative the best choice for throwing office Christmas party and make the occasion a huge success. 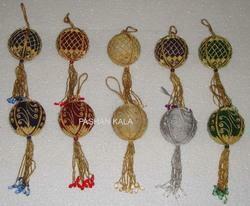 Zari Embroidery Christmas Ball offered is among the best choices offered that are used for enhancing the look and feel of the home interiors. With these exclusive finished embroidered hangings available in different finish options, these perfectly match up to the demands of the customers and other than homes can also be used in decorating church or workplace. Further, the rich finish and variety offered also make these decorative the best choice for throwing office Christmas party and make the occasion a huge success. Zari Christmas Hangings offered is among the best choices offered that are used for enhancing the look and feel of the home interiors. With these exclusive finished embroidered hangings available in different finish options, these perfectly match up to the demands of the customers and other than homes can also be used in decorating church or workplace. Further, the rich finish and variety offered also make these decorative the best choice for throwing office Christmas party and make the occasion a huge success. 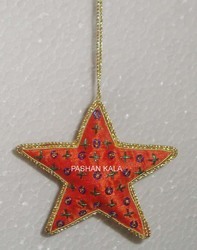 Christmas Star Decorative Hanging offered is among the best choices offered that are used for enhancing the look and feel of the home interiors. With these exclusive finished embroidered hangings available in different finish options, these perfectly match up to the demands of the customers and other than homes can also be used in decorating church or workplace. Further, the rich finish and variety offered also make these decorative the best choice for throwing office Christmas party and make the occasion a huge success. 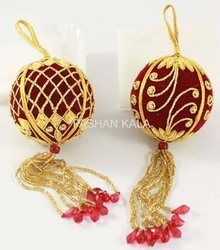 Zari Embroidery Decorative Christmas Ball offered is among the best choices offered that are used for enhancing the look and feel of the home interiors. With these exclusive finished embroidered hangings available in different finish options, these perfectly match up to the demands of the customers and other than homes can also be used in decorating church or workplace. Further, the rich finish and variety offered also make these decorative the best choice for throwing office Christmas party and make the occasion a huge success. 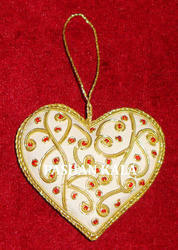 Hand Embroidery Christmas Ornament offered are perfect choice to light up the mood and prepare the home interiors for Christmas festival. These exclusive hanging fish decorative can be hanged from ceiling or a light fixture and are best choice to decorate a ballroom or to fill your room up. 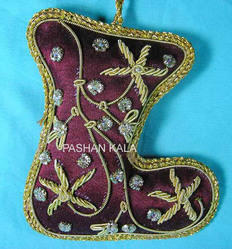 The attractive look provided by these fish shaped decorative also makes these the best party decorations that greet the guests and set up the stage for party..
Zari Embroidered Christmas Items offered is among the best choices offered that are used for enhancing the look and feel of the home interiors. With these exclusive finished embroidered hangings available in different finish options, these perfectly match up to the demands of the customers and other than homes can also be used in decorating church or workplace. Further, the rich finish and variety offered also make these decorative the best choice for throwing office Christmas party and make the occasion a huge success. 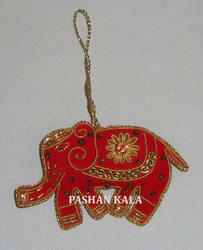 Looking for Christmas Hanging Ornaments Decoration ?